Here’s a new piano collection of African American Spirituals. It’s the first of probably four or five such collections. On my Facebook page, I asked for suggestions for a new spirituals collection that I wanted to arrange. The suggestions were excellent, and many are included in this first collection. 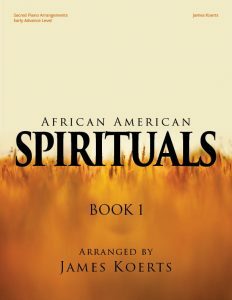 As I was researching the project, I found that there were nearly 50 African American spirituals that I was familiar with. I was amazed at how much material there is! So I’m excited about future projects! Here are the preview pages. You can purchase it here, and watch demo videos.